Storytelling is the buzzword these days, but how do you actually do it? Our Courageous Storytellers membership site offered a collection of storyteller resources to answer that question, and we want to share one of those with you. Our own Robert Carnes, author of The Original Storyteller, put together a list of 31 Storyteller Resources that can inspire and equip you to tell better stories. Whether you’re looking for a free resource or you’re ready to invest in some training, we’ve got the storytelling resources for you. 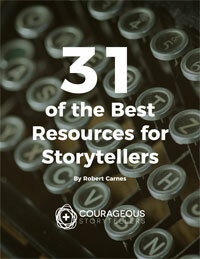 Download 31 Storyteller Resources now. Courageous Storytellers focused on storytelling this month, offering member resources to help you tell better stories. We’re talking webinars, how to develop a storytelling culture, how to find and catalog stories, tips for capturing compelling testimonies, and more. Learn more about Courageous Storytellers. Learn more about The Original Storyteller, and check out our interview with Robert Carnes. You can buy a copy or Courageous Storytellers members can get it for free.